From the catalogue of the Aerial Bold Project. Today we’re looking at an unusual application of satellite data, namely using it to create alphabets. The first example is the Aerial Bold Project, established by Benedikt Groß and Joey Lee in 2014. It set out to create typeface fonts from satellite imagery and they set-up a kickstarter campaign in November 2014 provide the funding for the project. The campaign raised $11,492 in thirty days from by 569 backers, and we were one of them! Regular blog readers will know we love anything quirky to do with satellite imagery, and this was something we wanted to support. Having secured funding, the project established a crowd-sourcing app, called the Letter Finder, to allow anyone to review Mapbox satellite imagery to try and identify landscape features, natural or man-made, that looked like letters or numbers – and over 11,400 were identified from 22 different countries. Our P from the Aerial Bold Project. All images were recorded, catalogued, and rated for beauty and readability. As one of the backers we were entitled to own one of the letters in the catalogue, and it will come as no surprise that we went for a P for Pixalytics, which you can see here! It is a small island within the Zevenhuizerplas, a 1.5 km water body created by a dam on the northeast outskirts of Rotterdam, Netherlands. Our letter received top marks for beauty, but not for readability; we can’t really argue with that assessment, as technically the P is lying on its side on real life! The Aerial Bold Project reviewed the catalogued letters to determine the best examples to create actual fonts. So far they have created three: Buildings, Suburbia and Provence. Sadly, our letter was not selected for any of the fonts. 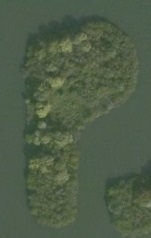 However, we think our P is beautiful and for us, a satellite image of trees surrounded by water is a great metaphor for the company. The project website gives you access to the fonts, the whole catalogue of letters and a fun typewriter app which allows you create messages from the sourced images – as we have done with Pixalytics at the top of the blog. Whilst researching this blog, I came across a second crowd-sourced alphabet from space! This one was co-ordinated by Adam Voiland, a science writer for NASA Earth Observatory. After seeing the letter V in smoke on a satellite image, he sought help from colleagues and readers to create an entire alphabet based on imagery and photographs taken by NASA. Adam’s version is different from the Ariel Bold Project as it uses letters created by images of transient things such as smoke or phytoplankton plumes within the alphabet. It took Adam over three years to complete his alphabet and all twenty-six letters can be seen on the NASA Earth Observatory website. Being satellite geeks, we love the fact that Adam has captioned each image not only explaining what the image is of, but also describing the satellite and sensor that took the picture! It was great to see such a range of satellites used within the alphabet. These alphabets are fantastic examples of unusual, innovative and fun ways of using satellite data, and we liked the fact that both were crowd-sourced. Why don’t you have a look at, and a play with, these crowd-sourced alphabets from space! This entry was posted in Citizen Science, Data, Earth Observation, Education, NASA, Remote Sensing, Space Can Help, Understanding Space, visualisation and tagged Adam Voiland, Aerial Bold Project, alphabets, Benedikt Groß, crowd sourcing, Earth Observation, Earth Observatory, Joey Lee, letters, Mapbox, NASA, numbers, pixalytics, remote sensing, Space, Zevenhuizerplas by Andy. Bookmark the permalink.